By Angie Drobnic Holan on Wednesday, August 4th, 2010 at 6:20 p.m.
Sarah Palin attacks the Democratic proposal on letting the Bush tax cuts expire for the wealthy. In an appearance on Fox News Sunday, former Alaska governor Sarah Palin answered questions about extending the Bush tax cuts. She said Democrats are "poised now to cause this largest tax increase in U.S. history. It's a tax increase of $3.8 trillion over the next 10 years, and it will have an effect on every single American who pays an income tax." The problem is, she's distorting the Democrats' proposals. They plan to raise taxes on the wealthiest tax payers, and it would not result in the largest tax increase in U.S. history. We rated Palin's statement Pants on Fire; read our complete report for details. 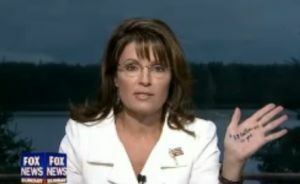 That $3.8 trillion -- the number she wrote on her hand -- is the cost over 10 years if all the Bush tax cuts expired. Democrats say they want to keep the tax cuts for individuals who make less than $200,000 and couples who make less than $250,000. Palin isn't the only one distorting the Democratic proposals, though. Rep. Randy Neugebauer, R-Texas, said that "94 percent of small businesses will face higher taxes under the Democrats' plan." This isn't even remotely true --even if the Democrats proposed letting tax cuts expire for all income levels, which they won't. The actual percent of small businesses who will see a tax increase is more like 3 percent. Because he was so far off, we rated his statement Pants on Fire! — Sarah Palin, Sunday, August 1st, 2010. — Randy Neugebauer, Thursday, July 29th, 2010. See report for complete sources.